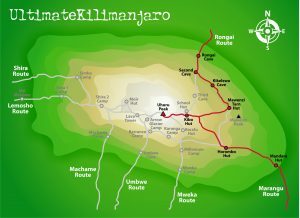 Below is a map of the Lemosho route on Kilimanjaro. A vehicle is used to bring climbers to the gate, where the trail begins in the rainforest. Lemosho trekkers have a longer distance to cover in the rainforest ecosystem than other routes, and as a result climbers do not exit the rainforest until the end of day two. 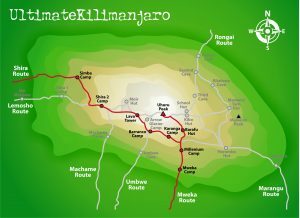 This schedule means that the Lemosho Route is a longer route,usually taking seven to eight days to complete. 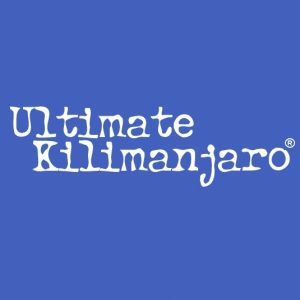 Though considered a difficult route, the added days on the lower slopes of the mountain make this the best route for altitude acclimatization. The descent is down Mweka, in the south-east. 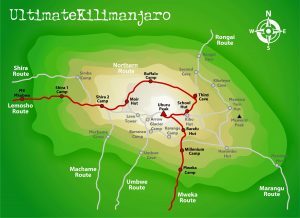 Because the starting point is far from Moshi, it is more expensive to climb this route due to the added transportation cost of getting climbers to the gate. Scenically, Lemosho is considered the most varied and most beautiful because it begins in the rainforest, crosses the spectacular Shira Plateau, and then combines with the Machame route to share its viewpoints around the southern circuit. Lemosho has low crowds until it combines with Machame. Lemosho is ideal for those who place a premium on proper altitude acclimatization, who are confident in their ability to walk over steeper paths for extended periods, and want a lesser used route. However, Lemosho is also more expensive than the other routes.